If you read my previous post on the matter you may already know how my new about box greatly increased the number of reviews for my smaller apps. If you wish to know why it worked so well, you should read this previous post first. In this last post I mentionned I was going to update my already very successful Battery HD app and include the same system encouraging reviews ( without alert boxes! ). This app has reached the top spot in many European countries many months ago and still gets a good daily 10k (free) downloads and I was expecting to get a few more reviews indeed. Aside from the new about box the update to the app was minimal: I just added an indication telling the user he could scroll down for more info when he tapped the battery. Before I included my new magical about box (described in detail in my previous post ) I got about 5 reviews per day on this app. Have a look at this screenshot to get an idea of how it looked for the few days before the update. How many reviews did I get today? 10? 15? Maybe 20 reviews? No the answer is 102. Yes, with this update my app got 102 reviews (one hundred and two) just today . Before writing this post I took a screenshot of my reviews in the excellent AppViz 2. When I took it, it was 15:15 Cupertino time. I don't know when review times start or end but I assume the day wasn't over yet. 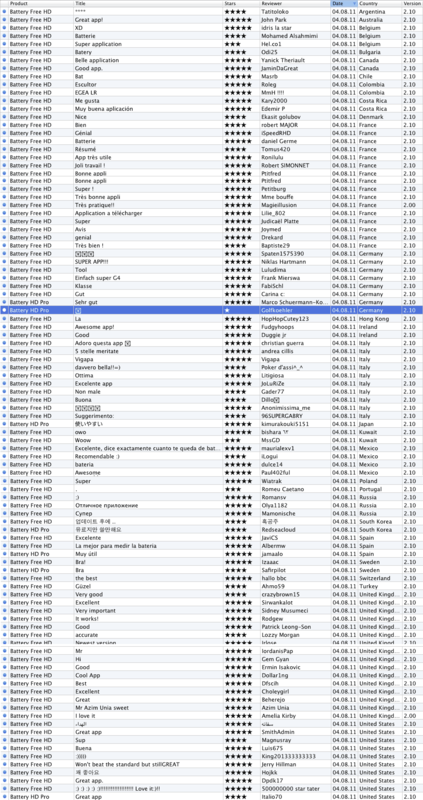 Behold the screenshot of 102 mostly very positive reviews for this unfinished day (large image). Sure, part of it comes from the recent update but that's still a 20x increase and maybe more when the day finishes. I just never had this many reviews for this app, not even when the app ranked #1 in France and other European countries and had double the daily downloads. First of all, let's not forget people liked this app a lot before. It had good reviews before this update. But if you look at the before and after screenshots, one thing appears clearly: not only the number of reviews skyrocketed, the number of negative reviews is pretty much ONE out of 102. As the previous article explained my strategy was simple: get reviews from happy customers and e-mails from unhappy customers, playing the "independant developer card" to calm them down. I am glad it worked for the reviews, but boy did it work for the e-mails too. I already received 21 support e-mails today. Previously I got about zero or better said maybe 2 per month. I replied to each one politely with as much ease as my knowledge of the language allowed (I just can't write very well all of the six languages I allowed users to write in, but that seemed enough to deflect bad reviews). I don't know if I'll always have the patience to handle so many e-mails but for now I am holding well. Actually I think of it as a good exercise to try to write in languages I would otherwise never use. Just a few minutes ago an update with the same new magical about box (and a small bugfix) was approved by Apple for my Led FlashLight Deluxe app. While not as successful as Battery HD this app still gets 2k downloads a day. Yeah, that's a lot for a freaking Flashlight. But it's cute and it has a nice icon which as I detailed here is a recipe for success (if you're lucky). It'll be interesting to see what the effect for reviews is on this one. Stay tuned for the report! The day still isn't' over (it's 16:43 in Cupertino) and the total reviews is now 132 for the free version and 12 for the pro version. That's a total of 144 reviews out of which still only one star review. Yes, an unbelievable 42 reviews have been added in the last one hour and 30 minutes when I first took the screenshot to prepare this post. A new day has started so I took a final look at the reviews for yesterday. The total is now 185 reviews for the free version and 14 for the pro version for a grand total of 199 reviews. Short said: wow. And the average is still at 4.5. Of course you have to remember this app had millions of downloads previously and that the update was downloaded on this day by 581,984 users. But this was also the case for the last 2.0 update on May 25 (which was a big feature update) and it got 11 reviews instead of 5... not 185. Thanks for sharing, very interesting. Did you sell more Pro version after this ?